1600 and 1280 res available @ Pixel Ellipsis. Quote: @flyindreams @debaoki Glad we got to celebrate Miyazaki-sensei's birthday! May he live another 430 years and turn into a silvery dragon! ...and this is the result. I couldn't resist walling everyone's favorite silvery dragon! Haku's outlines vectored-extended from this scan, and then I mouse-painted the colors in for a bit of a vectoring break. I loved how the colors turned out and really, really wanted to keep this wall texture-free, but once I added the awesome brush in the background from MouritsaDA-Stock I had to go with the textured version, 'cause I wanted the wall to look like ukiyo-e. Since it was really hard for me to decide which of the various textureless and brushless versions to feature, I've zipped them all up for your viewing pleasure. Enjoy! Browse Spirited Away Gallery: Recent | Popular. Ghibli makes awesome movies! Aww, I loved Haku in Spirited Away! He's dragon form was awesome looking. Very nice wall, I love the light colors! +fav Nice work! Awww! Haku! I reeeaaaalllllyyy need to rewatch Spirited Away. I haven't seen it in years litterally! Great wall! I love it! The background is awsome and fits the colour scheme nicely. Big love for this wallpaper. Love the colors and most of all love the dragon/subject. Thank you for sharing, nice work! Wow that's awesome. This is really OMG! Awesome job you done here! awww.. i love haku.. and this is a wonderful wall..
great wall, nice colouring +fav! I don't know... Remembers me CDZ and DBZ at the same time! 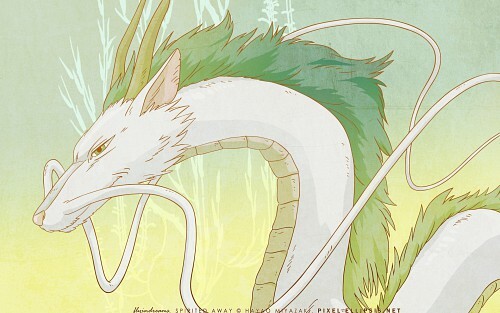 this is one of my favorite poses in spirited away with haku and you captured it beautifully. I liked how you took the time to bring detail to the important parts just to make it even that more of an unique piece. Very cool wallpaper. The soft colors are awesome.